Kris and Cloe’s daughter Noor enjoys a donkey ride in their home village of Aguddim. Kristoffer Erickson and Cloe Medina Erickson combined their passions for exploration, art and architecture, and community development to create Atlas Cultural Adventures (ACA). Kris is a professional athlete for The North Face, a professional photographer, and a certified AMGA and IFMGA mountain guide. Kris develops and guides ACA’s pure adventure programs, consisting of backcountry skiing, alpine and rock climbing in Morocco’s Atlas Mountain, Europe, North and South America, the Himalaya and Antarctica. Cloe is an architect and historic preservationist, and the founder of the Atlas Cultural Foundation. Cloe develops and leads ACA’s community engagement programs. 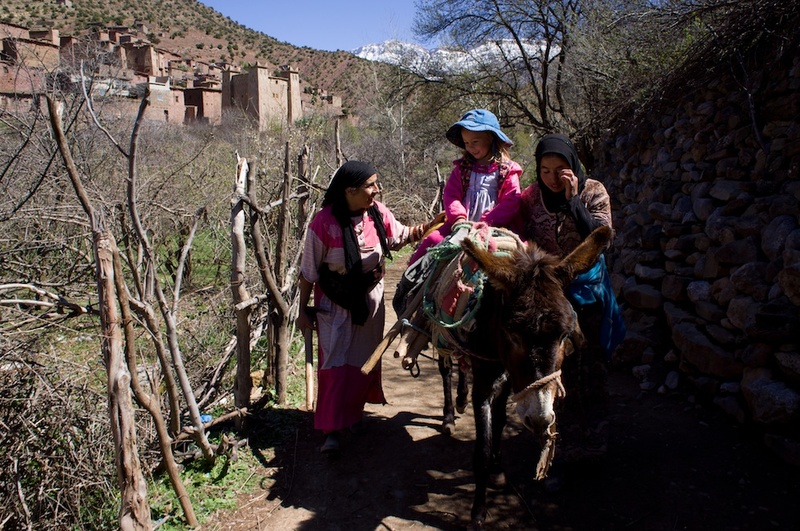 Kris and Cloe and their daughter Noor Amina split their time between Zawiya Ahansal, Morocco and Chamonix, France. Kris, Cloe and their Moroccan staff are all certified Wilderness First Responders.